Last April, I launched, with the cooperation of poets across the country (and one across the Pond), the "Tattooed Poets Project". In addition to the "regular" Tattoosday features, every day in April we featured the tattoos of poets. Each post featured poet-contributed photos, with a link back to BillyBlog, where one of their poems was posted on the corresponding day. Not all the poems were tattoo-related, but many were. This year, we are resuming the project again, featuring more poets, and a few returning ones. I enjoyed this adventure last year and am looking forward to another successful April! I don't know what it was about March, but this final post of the month is the third featuring ink from a member of our Armed Forces. His grandfather passed before he was born and he has always thought of him as the guardian angel that watched over him. This piece was inked at Aces & Eights Tattoo in Augusta, Georgia. Tom is a member of HHC 1st Battalion, 109th Infantry Regiment, 28th Infantry Division. Thanks to Tom for sharing his tattoos with us here on Tattoosday! I met Taylor where she works at Kaleidoscope, a toy store in Bay Ridge, Brooklyn. 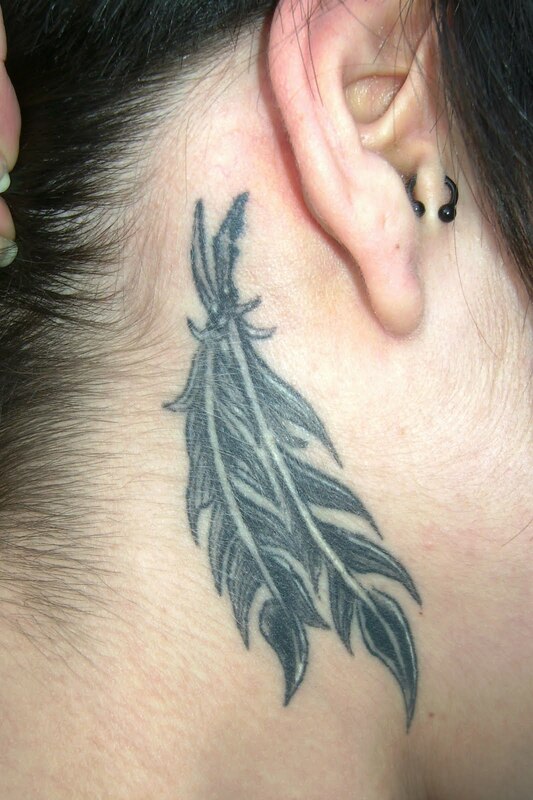 I gave her a flier after admiring her really cool feather tattoo that was inked behind her right ear. A week later, I was zipping by on my bike and saw her on a break outside the store. That was when I had a chance to speak to her about her tattoos and take the photos for this post. This is one of her nine tattoos, and was done by an artist named Chris who works out of Puncture Tattoo in neighboring Dyker Heights, Brooklyn. Taylor says the tattoo is inspired by the fact that she feels free-spirited, like a bird, and that her aunt, who died in a plane crash, used to call her a "little Indian girl". The dangling feathers behind her ear seem to capture both sentiments nicely. Taylor explained that she loves cats and her sister's gray cat Dusty passed away from breast cancer, which has also been a disease that has run in her family, as well. She had the tattoo artist, Peter Cavorsi, of Body Art Studios, model this piece based on Dusty's eyes. As always, Peter did a superb job. He is no stranger to Tattoosday, having inked one of my tattoos (seen at the bottom of the page) and several of my wife, Melanie's. This link will show you all of Peter Cavorsi's work that has appeared on the site over the last two-and-a-half years. 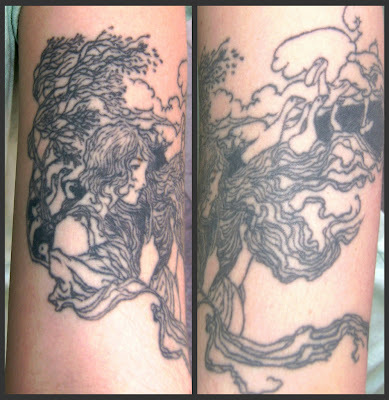 Thanks again to Taylor for sharing her two beautiful tattoos on Tattoosday! The artist behind this amazing work is Steve Woison formerly of Electric Tiki Tattoo in Patchogue, and now at Studio 520 in Oakdale, on Long Island. 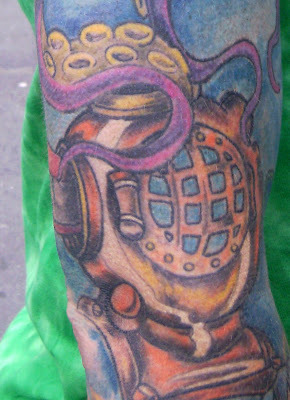 Thanks again to Mike for taking the time to share his amazing aquatic sleeve with us here on Tattoosday! As a soldier in New York City's 69th Infantry Regiment in the New York Army National Guard, Earl has had the honor and privilege of serving in our armed forces overseas. But, like any one of these brave men and women can tell you, they have seen their share of sorrow when they have lost fellow soldiers in the war in Iraq and Operation Enduring Freedom in Afghanistan. 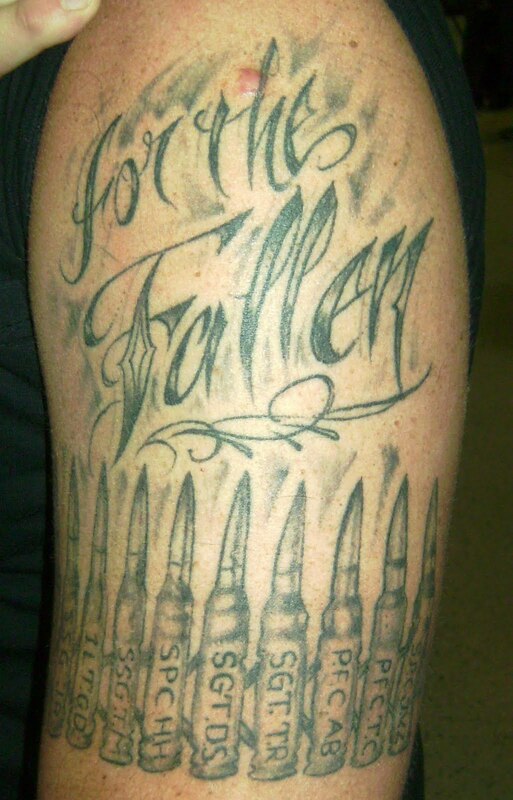 Earl's way to honor them has been to inscribe on his flesh "For the Fallen," and the initials of those that have died for their country, each bullet representing someone he knew. 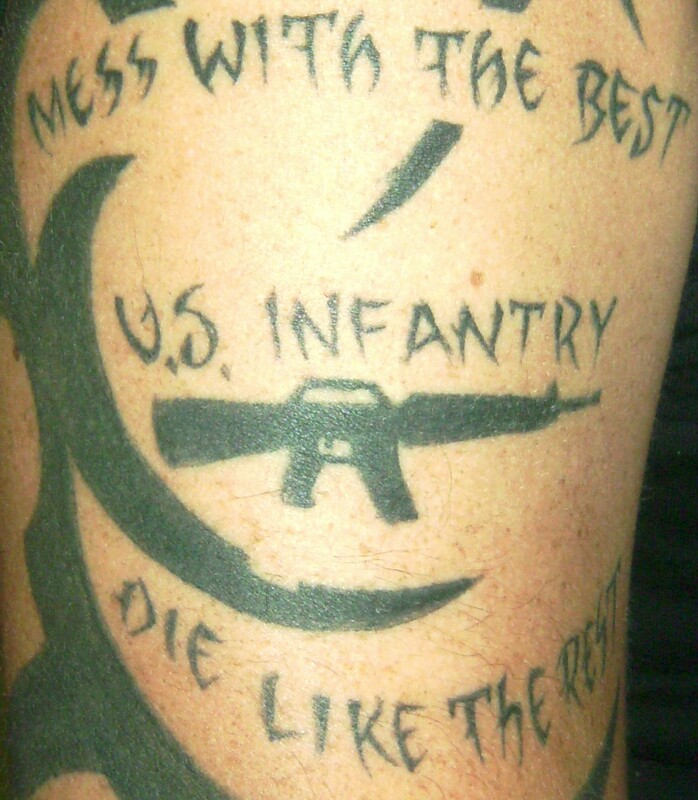 The phrase "Mess with the Best, Die like the Rest" is one of those military slogans that is designed to inspire the soldier and intimidate the enemy. 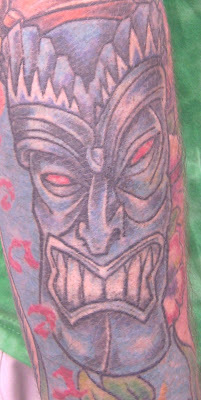 All work was by Mark Madden at Madd Grafix Tattoo Shop in Buffalo, New York. Thanks to Earl for his duty to this country and for sharing his memorial ink with us here on Tattoosday! 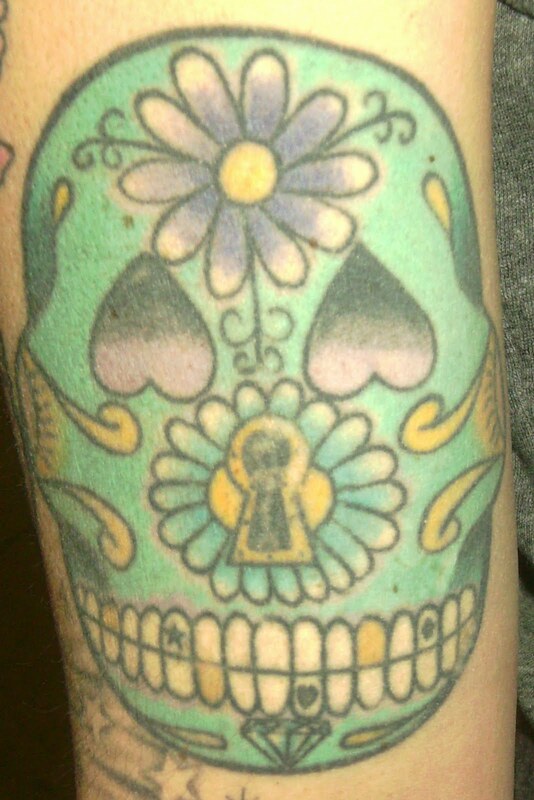 Clicking this link will display the vast range of sugar skulls that have appeared here on Tattoosday over the years. They are one of my favorite types of tattoos to post, because they tend to vary from one to another and can be uniquely personalized. Amy got this one on All Saints' Day, in honor of her grandfather. She was at the New Orleans Voodoo Tattoo Convention and an artist named Joey just free-handed the drawing on her arm. 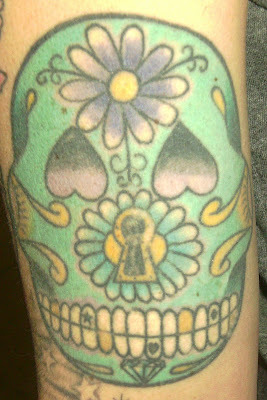 Thanks to Amy for sharing her sugar skull with us here on Tattoosday! I met Renee in the Clark Street subway station in Brooklyn Heights recently, and we had a fascinating conversation. 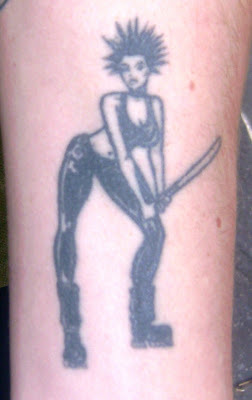 This is one of her self-inked tattoos which, she says, she did using "the prison method". This generally involves using a needle or a sharpened guitar string and dipping it in ink. Sometimes with, sometimes without, a jerry-rigged motor. 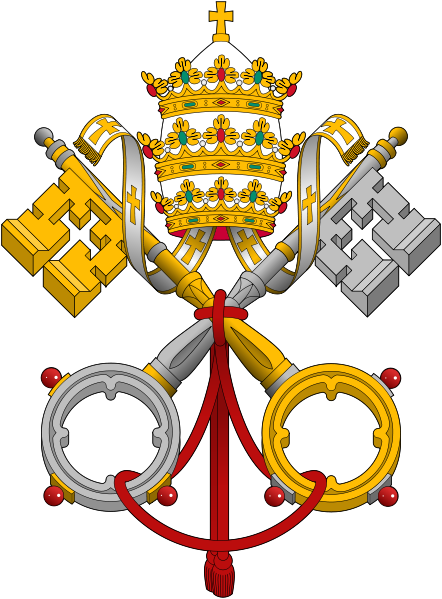 The design is based on the insignia of the Pope. At the time that she did this, she felt a connection to the Catholic Church that was very strong. Religion was a "huge part of her childhood"
However, as anyone paying attention to the news recently is well aware, the Catholic Church has been under fire for quite some time due to its handling of internal matters regarding abuse among the clergy. 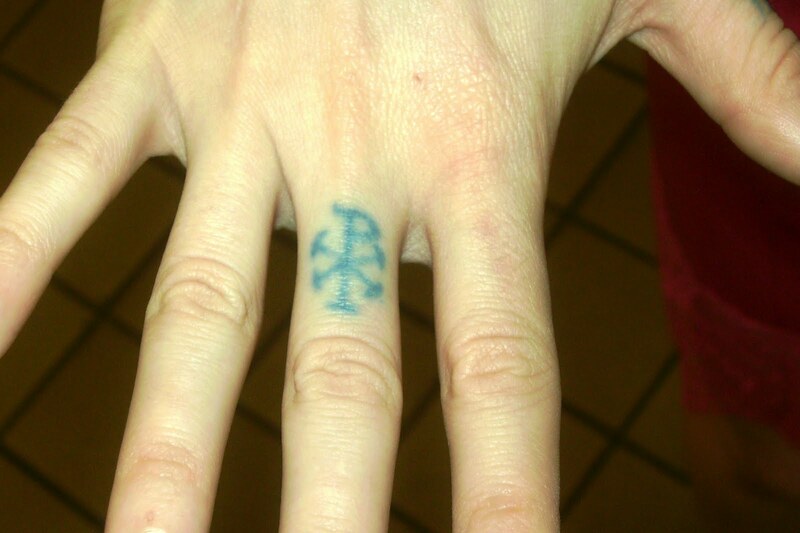 Renee finds that who she is now is "irreconcilable with the Catholic Church" and, as a result, she plans on having this finger tattoo covered up "as a statement" about her feelings and her conviction that this symbol is, in her words, "something I can't have anymore". 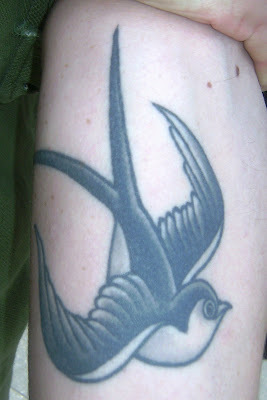 So today's post features a tattoo whose time is running out, which is not all that common here on the site. I have always maintained that the tattoos seen here aren't always the "best" in art, but rather, interesting encounters in New York with interesting people. Thanks to Renee for being so forthcoming about her personal connection to tattooing, and for sharing this small, seemingly harmless tattoo, that carries with it such a weight, laden with meaning. I met Richard in the Amtrak section of Penn Station, which I have found to be a wonderful place to find tattoos from all over the world. He was in the New York area on business, having traveled from Oregon where he lives and runs his company, Out of the Box Mods, LLC. His tattoos are directly related to his vocation of computer modding, which "involves making physical changes to a computer for aesthetic reasons or to improve the performance". Often, I will be sent, a better photo that was taken right after completion, or in better circumstances than my quick little snapshots in public. By comparing the photo I took with the one Richard sent, you get a better idea of how the tattoo artist envisioned the piece, down to the bruising of the skin around the torn flesh. The outline for the second piece is completed, for the most part, and it is soon to be colored. 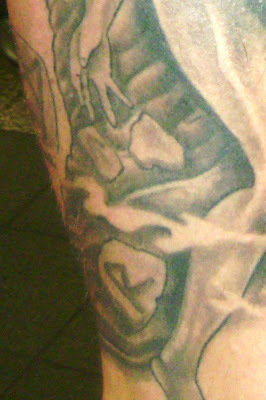 This style of tattoo is often referred to as "torn flesh" and is marked by an added dimension of perspective. When done properly, the effect of the tattoo is unsettling, as if the skin of the tattooed person has been ripped away, exposing the workings within. The variance comes in what lies beneath the skin, which allows individuals to express more about their selves through their tattoo art. See some other examples of the torn flesh motif as seen on the site can be viewed here and here. The machinery below Richard's outer layer of skin personifies that which drives him: mods. The work shown is the creation of tattoo artist "Lil Kev" at Ink-Daddy's Tattoo in Salem, Oregon. Richard tells me he's getting the forearm piece finished in a couple of days, so check back to see the link to the updated piece, once it's done. Thanks again to Richard for his participation and cooperation in sharing his cool mod tattoos with us here on Tattoosday! 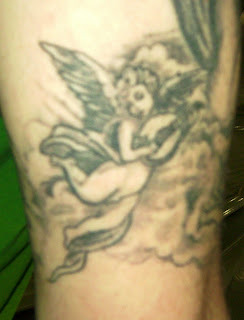 The tattoo marks the birth date 3-28-99 and spells out the name Vegas, for her son. What's particularly cool about this tattoo, which is on Heather's outer left forearm, is not just that she spells out her son's name in kids' building blocks, but that these blocks are also dice, which acknowledges the name Vegas, and its link to the city which is built on chance and luck. Other images that ring the name are a slot machine, a horseshoe, and a hand of cards featuring four aces. The colorful dice/blocks also feature some traditional tattoo designs, including the standard "Mom" design (on the A block). This great tattoo was completed in two sittings and was done by Baba, who works out of Vintage Tattoo Art Parlor in Los Angeles. Thanks to Heather for sharing her wonderful tattoo with us here on Tattoosday! 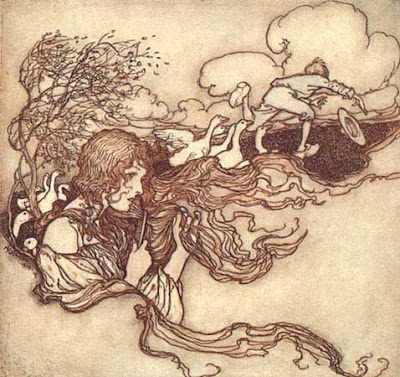 Laura explained that her mother had a lot of random books of fairy tales in their house where she grew up. 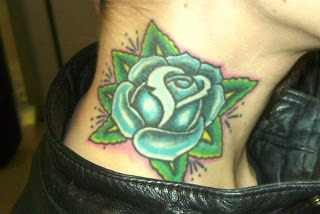 Laura counts this piece among her six tattoos. It was done by Rob Green at Whatever Tattoo in Manhattan. Work from Whatever has appeared previously here. Thanks again to Laura for sharing her beautiful tattoo with us here on Tattoosday! I met Jorge last week at the top of the escalators leading from Penn Station to 7th Avenue. 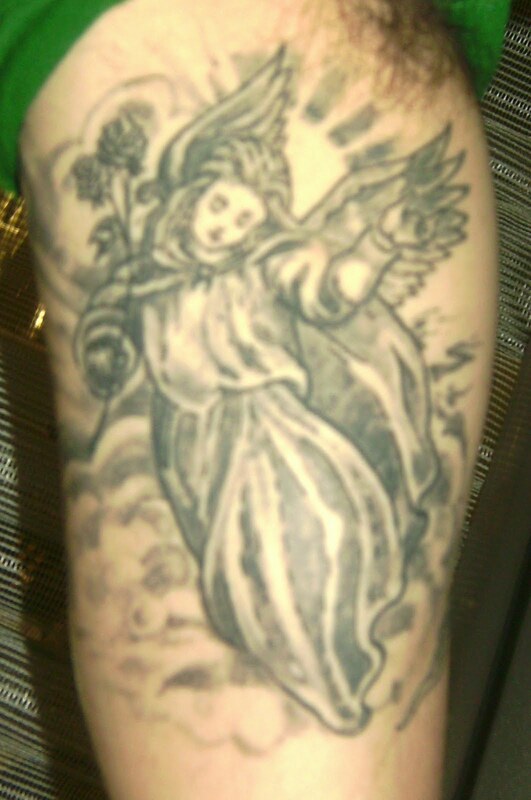 He has quite a few, and I took photos of the front and back of his left forearm. 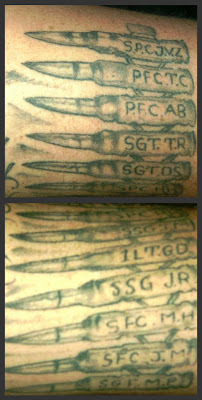 A friend of his did this for him, which he got for luck before going overseas with the U.S. Army to Iraq in 2008. He proudly served with the Third Brigade Combat Team, 101st Airborne Division, 187th Infantry Regiment, also known as The Rakkasans. 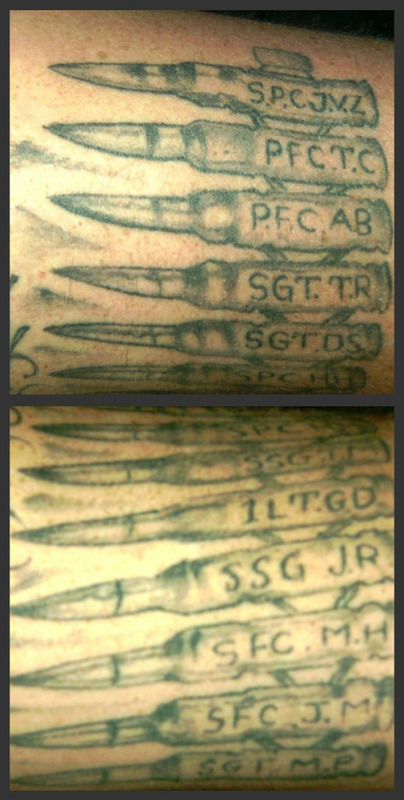 Jorge loves what he calls his "good luck koi fish" and says "We deployed for 15 months....every time I was tired for walking for 2 or 3 days nonstop, I would look at my tattoo and smile and keep walking...". This piece was just a very cool design. Jorge wanted to make sure they didn't get omitted from the post, as these flowers represent his mother and sister. He hadn't mentioned this when I met him, so I was pleased to include it in the post. Jorge got this piece at Coyote's Tattoo in Lima, Peru. He says this is a tribute to his mother and his Peruvian heritage. It is based on a pure gold artifact found next to a mummy in Peru which he saw on display in the American Museum of Natural History. 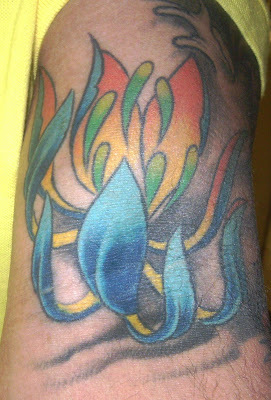 Thanks again to Jorge for sharing so many of his tattoos with us here on Tattoosday! 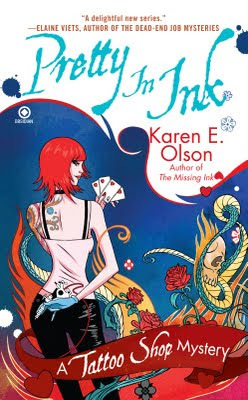 Last year, when Karen E. Olson released The Missing Ink, I didn't know what to expect. Here was a mystery writer presenting us with a novel in which the main character was a female tattoo artist who owns her own shop, The Painted Lady, in Las Vegas' famous Venetian Hotel and Casino. Brett Cavanaugh, the creation at the center of Ms. Olson's universe, is certainly a compelling character. She is a business owner, living with her police officer brother, and working with several memorable characters. I wanted to like the first book and I wasn't disappointed. It's a fun read and does a nice job of keeping the reader interested. The fact that it is tattoo-centered only made it that much more enjoyable. For those of you who missed it, my review of the first book is here. So it was with much anticipation that I awaited the arrival of the second volume of the "Tattoo Shop Mystery," Pretty in Ink. As a punster, I appreciate the titles as well. What ensues is a murder mystery in which a tattoo, this time of a Queen of Hearts playing card, plays an integral role. I love it, of course, because the book explores the tattoo beyond the symbol - there is a whole reality spinning out from behind the symbolic nature of the piece. Olson's Brett Cavanaugh is surrounded by the supporting cast we met in the first book. Back is Bitsy, the diminutive "little person" who is the shop manager, as well as Tim, Brett's cop brother, who is also her roommate. Also back are Jeff and Sylvia Coleman, the "old-school" mother-and-son artists on the Strip, and the robust Joel Sloane, a shop artist who is weight-challenged and a confidante of our heroine. Of course, there is more, with sexual ambiguity, Las Vegas politics, homeland security issues, a new potential love interest, and lots of tattoo talk. I must admit I liked Ms. Olsen's second book in the series more than the first. Perhaps it is the familiarity of the characters, but I feel it is more than that. Olsen has hit a groove and is running at full speed. If you're looking for a quick, fun read and want to be entertained by a cast of fictional characters in the tattoo industry, you should certainly give this series a try. Olsen knows her stuff, and has created a clever literary world at The Painted Lady with Brett Kavanaugh. She's certainly my first choice in the world of fictional tattoo artists. The past week has been a fresh reminder of how wonderful inkspotting is in New York City. When we have warm weather, that is. Today's contribution comes from Nick, who I spotted earlier this week inside the front entrance of a large chain coffee establishment. This conceptual piece reflects, in Nick's words, "[Carl] Jung's theory of the duality of self". This is depicted as the mythological figure Narcissus (at top) staring at his mirror image. However, in a spin on the myth, Narcissus is transfixed not by his beauty, but by the conceptualized vision of the inner self, which appears demonic. 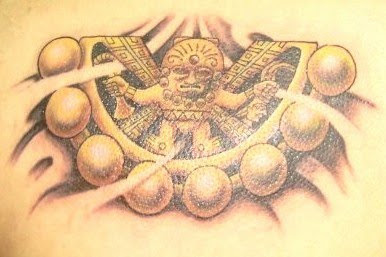 This can be interpreted and discussed in many ways, which is one aspect of what makes this tattoo so interesting. Nick had this piece done at Craig's Tattoo Studio in St. Louis, Missouri. Thanks again to Nick for sharing this cool tattoo with us here on Tattoosday! I met Samantha in Penn Station when I was passing through the New Jersey Transit waiting area earlier this week. Samantha got matching tattoos with her mother when she was sixteen. I joked with her that I shouldn't post that, since I've told my daughters that they have to wait until they're eighteen before getting inked. She pointed out that this happened in Canada, so perhaps we could use that as an excuse. 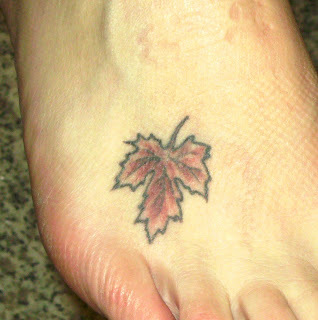 As a Canadian, she wanted to get this maple leaf to honor her homeland to the north. 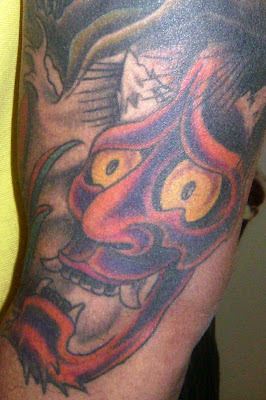 The tattoo was done at Blue Devil Tattoo and Piercing Studio in Tampa, Florida. Thanks to Samantha for sharing her tattoos with us here on Tattoosday! Looks pretty good, right? Not so fast. It is not often that I get someone sharing a tattoo with which they're not completely happy. This is one of those cases. Angela had an issue with the artist, Jon Comstock at Skin City Tattoos, in New Windsor, New York, and felt that his vision, ultimately, differed from hers. Too much neon-like color, less realism in matching her eyes, Angela said. The end result, a fairly visible tattoo that has an ambivalent host. "I wouldn't go back to him," Angela said. she admitted it looked better than she remembered. Despite the mixed feelings about the piece, I would like to thank Angela for sharing her tattoo with us here on Tattoosday! In the epic poems at the center of Norse mythology, known as the Poetic Edda, one key section from a collection known as the Hávamál features Odin hanging from the world tree, revealing the origins of the runes, which are seen in detail below at the bottom of the tattoo. Sean's tattoo is a tribute to his Norwegian heritage. 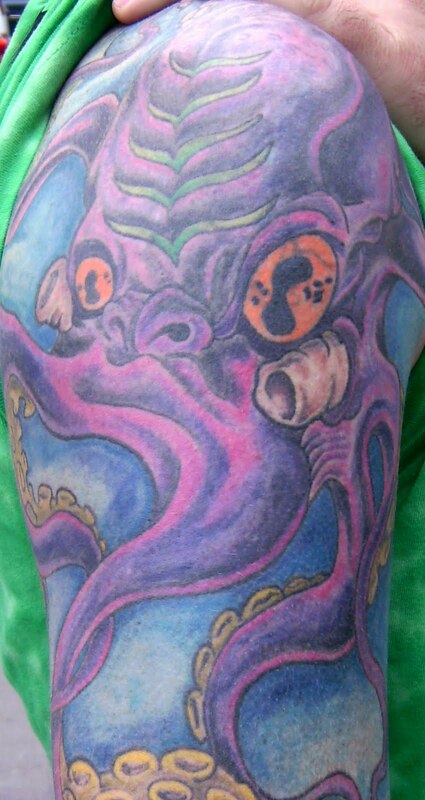 This piece was tattooed in three sittings by Bobby Chichester at Empire State Studio, in Oceanside, New York. Work from that shop has appeared previously on the site here. Thanks to Sean for sharing this incredible tattoo with us here on Tattoosday! 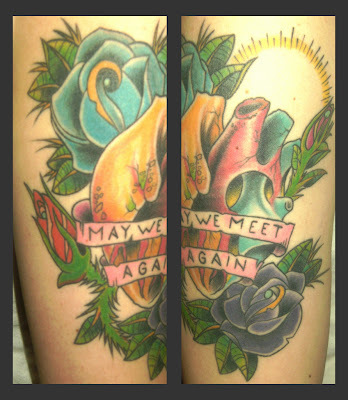 I met Vanessa last week and she generously shared two of her wonderful tattoos. 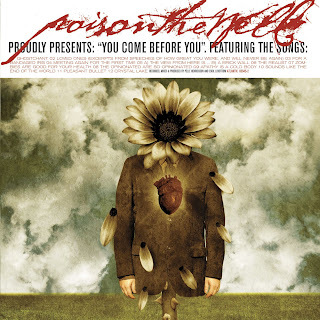 This design is based on the album cover of Poison the Well's You Come Before You. Vanessa explained that this was the album she listened to when she was visiting her mother in the hospital. Her mom recovered, and she associates the record with this time of her life. The tattoo celebrates those moments. Unlike with her mom, Vanessa does not have a relationship with her dad. The optimistic banner "may we meet again" is a glance forward, toward the possibility of someday reconnecting with him. This large tattoo, on her right biceps, took eight hours, all in one sitting. The detail of the anatomically-correct heart is amazing. Vanessa pointed out how the artist added flowers to the design, as well as the rays of light in the upper right corner to create the shape of a figurative heart, as well. Both pieces were created by Anthony Mealie at Tattoo Lou's in Selden, New York. Work from that shop has appeared previously here. 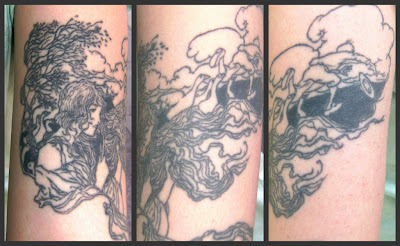 Thanks again to Vanessa for sharing her wonderful tattoos with us here on Tattoosday! Last Wednesday marked the official end to the veritable tattoo drought this winter in New York has afforded us here on Tattoosday. In addition to the three people I met at lunch, my train ride home and, subsequently, my day, was punctuated by a fleeting encounter with a woman named Stevie on the R train. I had just plopped down in one of the seats after having moved car-to-car between stops, in an effort to get toward the back of the train. I mention this to illustrate how fortunate I was to be where I was, when Stevie boarded the train. She got on at one stop and, by the time she had exited two stations later, I had had just enough time to take a picture of the wonderful tattoo on the back of her right calf, and pass her the blog info so she could contact me with more details. Stevie has seven tattoos and this one came from the incomparable New York Adorned at the talented hands of Virginia Elwood. 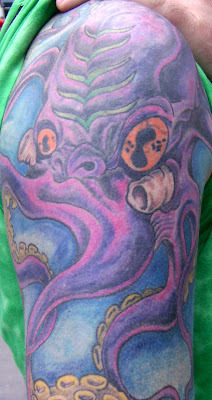 Stevie worked over several sessions with Virginia, ironing out the details of the piece, which was completed in one sitting. 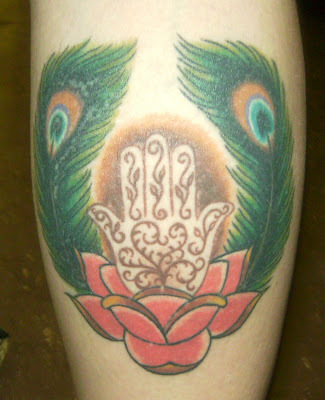 There are three elements to the tattoo: the lotus, the hamsa, and the peacock feathers. I moved out here from the West Coast to teach in inner-city schools. When I first started teaching and things would get nerve-wracking I'd tap on this hamsa hand necklace I always wore. For whatever reason it calmed me down and reminded me that I was here to infuse some change and to do some awesome work. When I became an NYC Public School teacher I decided I'd like it on me permanently. The hamsa hand is a symbol of faith and clarity and that's what I think I found in myself, like my calling. The lotus flower goes along with this idea of rising to the surface and blossoming while the peacock feathers were an aesthetic touch. Work from New York Adorned has appeared previously on the site here. Thanks so much to Stevie for sharing her amazing work with us here on Tattoosday! Last Wednesday I had a productive inkspotting lunch hour, which culminated with meeting Devin in front of Penn Station. 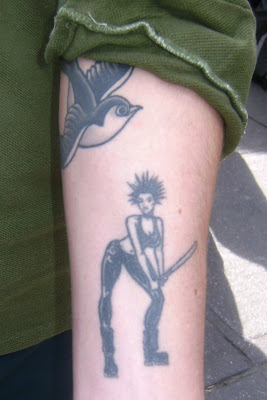 This "punk rock chick" is based on an old Rancid logo. Aside from being a fan of the band, he liked the design, as well. It was tattooed by Brad Schicklgruber at Mackenzie's Tattoo in Carmel, New York. It seemed fitting, then, that Devin had this done by Eddie at Sam O'Reilly's Tattoo Parlour in Santa Cruz, California. O'Reilly's, established in 1891, is one of the oldest shops in the nation and has top-notch artists. Work from O'Reilly's has appeared previously on our site here. Thanks to Devin for sharing his tattoos with us here on Tattoosday! This is another special edition of Tattoosday, a variation on the Tattoos I Know series. First seen on Valentine's Day, this is an episode of Tattoos I Love. Melanie's favorite flower is the iris. She wanted something pretty along those lines, and gave Peter a couple of samples of artwork as a reference. 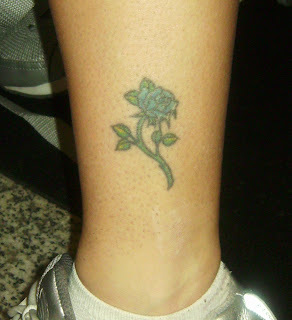 The second subject of our March 10 tattoo bonanza is Trina, who sports seven tattoos, several of which are on her legs. After her sixth piece, her mother chided her, saying teasingly, "You have all of those tattoos, and none of them are for me?" 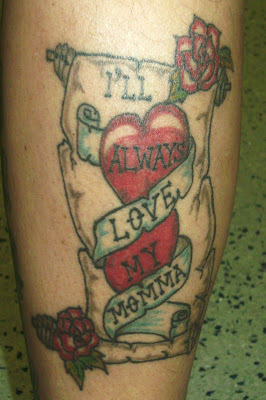 Reading "I'll always love my Momma," this piece was inked on the back of one of Trina's calves at Uptown Tattoos & Body Piercing in Harlem. And what does the woman to whom this tattoo is dedicated think of it? "Mom loves it," Trina grinned. As well she should. 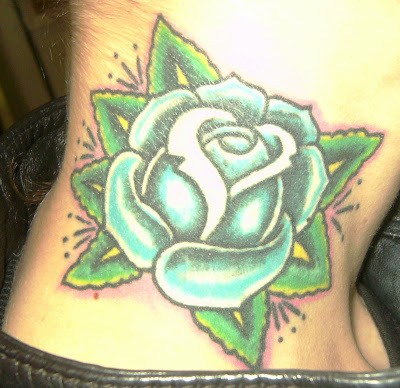 Thanks to Trina for sharing her tattoo with us here on Tattoosday! A burst of pleasantly warm weather this week signified the end of a quiet winter. Posts have been scarce indeed, but I see busier times ahead. Wednesday afforded me my first "Tat* Trick" of 2010. That term, for those unfamiliar, is reserved for a day when I meet and photograph at least three tattoo hosts. Even rarer is the "Lunch Tat Trick," which involves me getting photos from three people (or more) in the course of an hour, on my lunch break. So I am grateful for the following contributor, and the two three other nice people from the 10th of March. 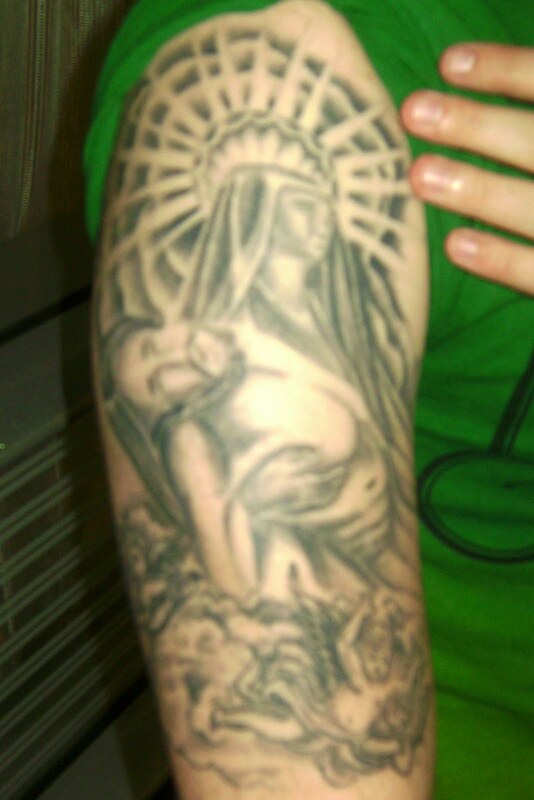 Thanks to Juan for sharing this tattoo with us here on Tattoosday! * Ed. 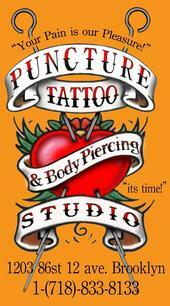 Note:Tattoo purists often raise an eyebrow at the term "tat" to denote a tattoo. I generally employee it when I am attempting a clever play on words. Sometimes, I fail. Hoot! Hoot! Thanks for Your Support! !